2019 Northeast PETS has come and gone, but not our commitment to the Presidents for the 2019-2020 Rotary year. We promise to inspire Presidents-Elect to lead their clubs and to empower them to achieve success! Thursday afternoon will kick off with dynamic sessions on Public Awareness and Imaging and The Rotary Foundation and Our Clubs. Thursday’s program will provide the chance to form Rotary and professional partnerships with your NEPETS classmates. Friday morning facilitated interactive sessions begin at 8 am and continue through Saturday noon. The focus will be on leadership strategies for successfully leading your club and inspiring volunteers; engaging members and investing in your community through service projects; making Rotary relevant to different groups and attracting young professionals to your club; creating a sense of enthusiasm and momentum in your club; sharing success stories where clubs collaborated with other clubs and with other community partners to leverage resources for bigger impact; and finally, how do Rotary’s youth programs bring vibrancy and energy to your club. This year’s five keynote speakers will inform and reinforce our program and our conversations, inviting us all to consider concepts like “thinking out of the box”; becoming a change agent; leading your club to be more project oriented; collaboration and flexibility. You will leave this PETS program feeling “fired up” and eager to begin the amazing year ahead as your club’s President! The Northeast Presidents-Elect Training Seminar (NEPETS) is Rotary’s training program for club Presidents-elect and Assistant Governors throughout New England and parts of Canada. The goal of NEPETS is to prepare Presidents-elect and Assistant Governors for their upcoming roles through provocative plenary speakers, in-depth breakout sessions, discussions with peers from various districts, and informal fellowship and networking with other Rotarians. 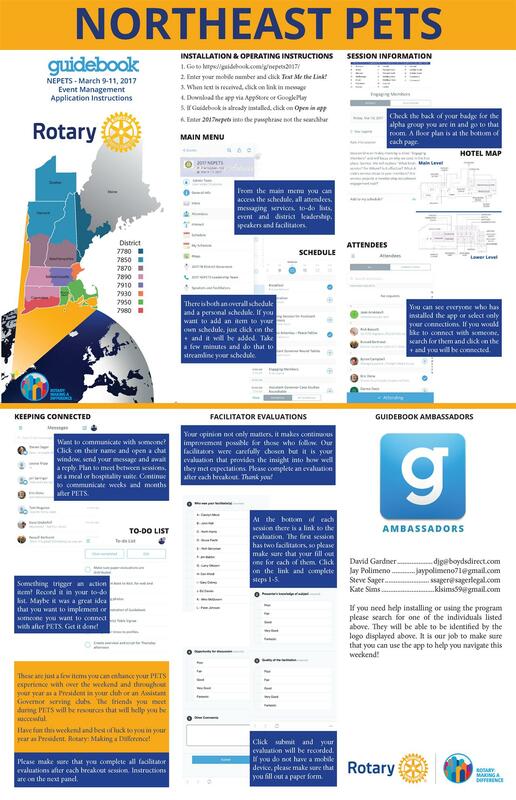 NEPETS is a collaborative effort of eight Rotary districts and includes the states of Connecticut, Rhode Island, Massachusetts, Vermont, New Hampshire, southern Maine and southern Quebec. Each spring, 500+ Rotary Presidents-elect and 100 Assistant Governors gather to learn about Rotary and develop skills to ensure that their upcoming year is successful. All incoming club presidents must attend training. If your schedule does not allow you to join us, you can find alternative locations and dates at www.petsalliance.org Please get permission from your district governor if you need to make alternate plans. When is the 2019 Northeast PETS? NEPETS will take place on March 7-9, 2019. You don't want to miss Thursday afternoon's sessions as they will be the spark for the balance of the event. Our gala dinner on Thursday evening will be highlighted by RI President-Elect Mark Maloney. The general sessions and breakout sessions start on Friday morning, and the program wraps up Saturday around noon. Northeast PETS is headquartered at the Sheraton Framingham Hotel and Conference Center, in Framingham, MA.